Searching for a quick lunch in downtown Vancouver? Look no further. From my dimly lit dining table, I barely recognized the scruffy haired Love Actually star standing on Alberni Street. Liam Neeson was exiting Italian Kitchen, one of his regular Vancouver spots that serves Italian inspired cuisine and often bears lineups out its front door.For a taste of the stylish, star-studded eatery’s offerings — minus the wait — visit their adjoining, newly revamped take out window. The menu, including all of your Italian staples, has just increased twofold. 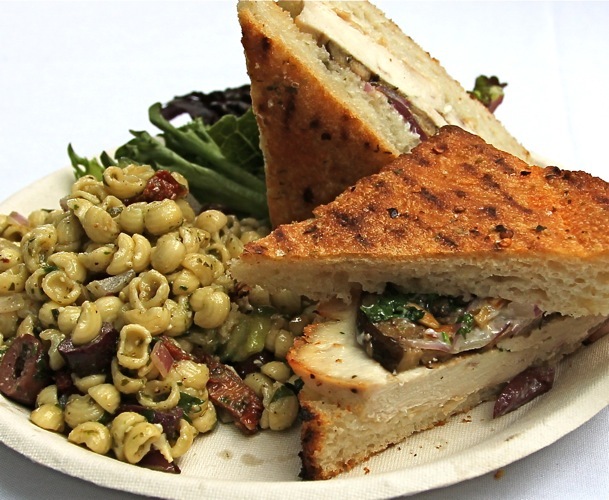 My grilled Siena Panini ($6.50) — a bargain and a half — was built on crispy, herbed focaccia and filled with roasted eggplant, tender chicken, large nuggets of kalamata olives, and toasted almonds — adding a deliciously sweet nuttiness to the otherwise savory sandwich. My pasta salad — the Noccioline ($5.95) — had me at the site of pesto. The mini shell pasta was tossed in the heavenly green sauce and spruced up further with tangy chunks of sundried tomato.